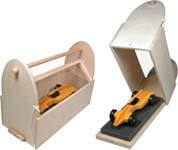 Pinewood Derby Car speed tips and products to help you win the race. It's as easy as ABC! Check each page of our site for more tips to help you build a fast pinewood derby car. Most Pinewood Derby cars will fishtail to some degree as they roll down the track. Fishtailing slows the car down by increasing friction when the wheels touch the center guide rail. You can reduce fishtailing by sanding the front of the car so that the wheels on the front are slightly closer together. Then as the car goes down the track, only the front wheels will touch the center guide rail. Some cars roll faster backwards than they do forwards. If you can, test your car before the race to see which way is faster. 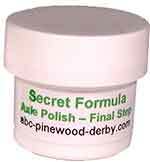 If you know that you are going to be up against some very fast pinewood cars, focus on one of the workmanship or design prizes. Building a good looking car with a creative design can be more fun than making a fast car. Some Pinewood Derby wheels are faster than others. Buy several sets of wheels and spin each wheel on a polished axle. Use the wheels that spin the longest. Don't use any wheels that wobble. 76 tips to help you build a fast pinewood derby car. Free with every order. Easy step-by-step instructions covering building tips and all the latest speed tricks and secrets. All of our car designs use only straight cuts so they are easy to make! Includes easy instructions with templates. Your car will go straighter and faster. Available with axle holes or slots. of car shapes with our plastic parts. do the hard part for you. to build these awesome cars including paint. Short on time? Just add wheels to our painted cars. Our completed cars are ready to race. Lego Car Race with our Lego car frames. Decals, Accessories and Paint - Your car will stand out from the crowd. Water based paints that give great results and easy clean-up. Completely covers your Pinewood Derby car. Paint is not needed. Includes black skin for windows. Make your car look fast even when it is standing still! Easy to apply. Make an animal car and stand out from the crowd. Legal in all races. Make your car stand out from the crowd with these exciting decals. Roll bars, spoilers, hood scoops, engines police light bars, eyes and much more. Speed Supplies - Products that can make your car dramatically faster! Each of our wheels has our speed rating. Pick the fastest wheel that is allowed in your race. All the latest building tips and speed secrets. Watch this and give your car a BIG speed boost. We have a variety of speed axles. Try our new graphite coated axles! The best dry and liquid lubricants available. Reduces friction between the wheels and the car body. Prepare your axles the right way with our axle polishing kit. Variety of weights to bring your car up to the 5 oz. limit. Our two-step secret formula is easy to use and gives excellent results. Use these tools to fine tune your car and give it the winning advantage! Products for Before and After the Pinewood Derby Race! A great place for your car after the race. The easy way to paint your pinewood derby car. 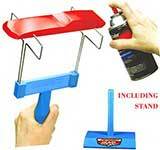 Includes a stand to hold your car while the paint is drying. Safely carry your car to the race in style. Protect your car in a clear plastic dome. Everything you need to bring your car up to the 5 oz maximum weight. Includes car scale, weights, stickers and speed book. Car inspection, race staging and more. A hilarious movie about a Pinewood Derby competition that the dad's take too seriously. finish line first. Fun for the whole family. Detailed instructions on how to use many of our products. Often you will find that one of the front wheels is raised slightly after you've built your car. A raised wheel will actually make your car go faster but some rules don't allow raised wheels. Here's How to fix a raised wheel on a pinewood derby car. If your rules allow raised wheels, here is how to raise a front wheel to make your car faster. Lubrication is often neglected. Our pinewood derby car graphite is a special formula using the highest quality graphite available. For beginners, here is how to Use a Coping Saw and how to Use a Rasp. And here are some tips on how to paint your pinewood car. Our instructions on how to build a fast Pinewood Derby Car will give you some ideas on how to make your car faster. As a finishing touch, read How to Paint Chrome Spokes on pinewood derby wheels. It's easy to do and makes your car stand out from the crowd. Advanced racers can read our pinewood derby rail riding speed tip. This new technique can give your car that winning edge. We have a variety of pinewood derby wheels and pinewood derby axles that have been cleaned up and polished for maximum speed. You want your car to weigh right at the 5 oz limit for the fastest speed. Our weights for pinewood derby cars come in a variety of shapes and sizes. Hello, we recived the pinewood derby cars and my son and daughter were both very pleased, they loved them, my daughter even won most patriotic in the tag along devision, and it was her birthday. She won two of her 3 heat races. My son didn't win any but it was very close, his car weighed in at 4.9 oz after we added the weights and stuff. The cars were very popular, they loved them, thank you so much for making it sure we recived them in time, I recived them on Friday evening so we had time to paint and stuff after we got them. Thank you for your time.... Tony B. Wheel vibration will slow your pinewood derby car down. Make sure that the tread of your wheel (the part that touches the track) and the rim (the inner edge of the wheel) are smooth and that your wheel is as round as possible. Watch the video of our rocket powered Pinewood Derby Car.